PARIS, FRANCE--(Marketwired - Mar 17, 2014) - Time travel has long fascinated the human race. Whether people look forward or back, there's a sense that breaking free of time's ceaseless march would make life just a little bit better. And while successful time machines have yet to be developed, the future can in fact be glimpsed at the Paris Charles de Gaulle Airport Marriott Hotel. Its newly renovated meeting rooms integrate cutting-edge technologies, service and style for a meeting experience unlike anything seen before. Of the hotel's 12 conference rooms near the Paris CDG airport, three have been renovated according to Marriott's signature Next Generation Meeting Room concept. The principles behind the change stem from extensive research on how business is best conducted today. Those findings led to a holistic approach to meeting planning where, instead of focusing on rates and layouts, meeting planners can consider their individual goals and then tap Marriott's extensive services for ideas, suggestions and available spaces to achieve them. At this Paris airport hotel with a dozen conference rooms, that approach has yielded impressive results. For starters, seating involves more than endless rows of uncomfortable chairs. Instead, clusters of cushy seats invite small groups to gather and brainstorm, while the traditional boardroom setup has been upgraded to feature sumptuous chairs and a spacious table that put delegates in their best creative space. Modern color palettes sweep over the reimagined rooms in soothing neutrals that are enlivened by pops of greens, oranges and yellows. Natural light pours into each room for a refreshing atmosphere. And state-of-the-art technology like video conferencing, smart whiteboards, projection walls, docking stations and touch-screen controls not only enhance each meeting's productivity, but also set this property apart from other 4-star hotels in Roissy. 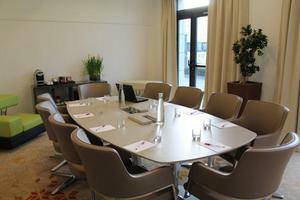 The redesigned meeting rooms nicely complement Marriott's forward-thinking services. In addition to a Meeting Services App that allows planners to make changes and requests in real time as the meeting is underway, the Meetings Imagined platform opens up a treasure trove of ideas, tips and examples to event coordinators. Meeting planners can simply visit MeetingsImagined.com to cull images, suggestions, trends and customizable options based on the specific objective of their event. The newly renovated meeting rooms at this property may not be a time machine per se, but they do serve as a window to what's possible. And once glance at that reveals a future that is beyond bright. Travelers arriving in Paris will find comfort and style just a mile away at the Paris Charles de Gaulle Airport Marriott Hotel. A recently renovated lobby, bar and restaurant set the tone for this attractive property where 300 guest rooms and suites welcome visitors from around the world. At these hotel rooms in Roissy en France, guests can luxuriate in Frette linens, pillow-top mattresses and featherbeds, or take advantage of the spacious work areas and wired and wireless Internet access to catch up on work. The 17 meeting rooms include 12,648 square feet of space with generously sized ballrooms that can accommodate conferences and weddings with equal flair. A fitness center and sauna let guests guiltlessly indulge in that famous French cooking, whether out and about or on-site at Le 5 Restaurant and Lounge. Alternately, guests can pick up something from the Grab-n-Go Boutique if they're on their way to visit one of the many nearby attractions. The Villepinte Exhibition Center, Aeroville Shopping Mall, Parc Asterix and Disneyland Paris Amusement Park are all easily accessible from this four-star hotel. Natural light pours into each room for a refreshing atmosphere. And state-of-the-art technology like video conferencing, smart whiteboards, projection walls, docking stations and touch-screen controls not only enhance each meeting’s productivity, but also set this property apart from other 4-star hotels in Roissy.